Good Monday beautiful friends and Welcome! to any Sew Pro blog hoppers! In September I had the fantastic opportunity to attend the very first Sew Pro Convention in Chicago. We were privileged to attend classes delivered by the stars of the sewing industry. The classes were all about taking our sewing hobby and turning it into a sewing profession. There were many amazing teachers. I attended classes with Allison Glass, Sara Lawson, Pat Sloan, and Tula Pink. My family and friends around me got to hear how excited I was (for months leading up to the convention) about meeting Tula Pink for the first time so it is really no surprise that I decided to feature her in my installment in the SewPro Star’s Blog hop. The Tula fandom in my house runs deep. You can see that in this book review my daughter did. See what I mean? Tula Pink and Pat Sloan were both keynote speakers and I would say that they taught me the most and I think the most important thing I took away from the event was that: There is a place for me, and I am enough right now. Pat Sloan really drilled it into us that the point we are at right now is the perfect place to start. There is no magic time in the future when suddenly we will have everything figured out and be ready to “break into the Business”. And Tula Pink shared so much about her process and how there is no such thing as running out of ideas. I had been doubting myself because I worried that I didn’t know what I was doing or that I was doing things the hard way. After listening to Tula though I realized that our processes are so similar and I really needed to just persevere! So when I got home I got straight to work. My quilt top is complete and now that I have all necessary supplies I’m excited to free motion quilt it on my home machine, I’m thinking of doing a meandering star motif. Should be lots of fun. I can’t wait to get it all done. 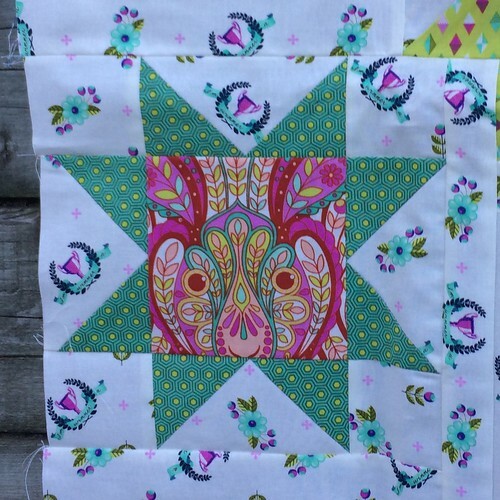 I call this baby quilt the Be A Star, Baby quilt and hope to offer the pattern for sale in the new year. Speaking of which, if there are any readers interested in pattern testing please shoot me an email, I’ll be ready for testers in about a week. I love star blocks and felt like my first “real” quilt pattern must include them and these sawtooth stars were prefect for displaying my focal point charms. https://widget-prime.rafflecopter.com/launch.js and visit the blogs of my various friends from Sew Pro. This hop will be going on all week and there are so many opportunities to see how SewPro inspired us and hopefully it will inspire you too! Have you ever attended a sewing convention? Are you interested in pattern designing? Did you attend SewPro? What is your favorite thing you learned? I agree, I took the most out of our keynotes. They were both so awesome and inspiring, each in their own unique way. I love the way your baby quilt turned out!! Your quilt is lovely. It really was a wonderful experience. My favorite part of it all though was getting to meet everyone and network. Thanks for the help! I believe I’ve fixed it. Wow what a beautiful quilt! Great job. You did a great job! 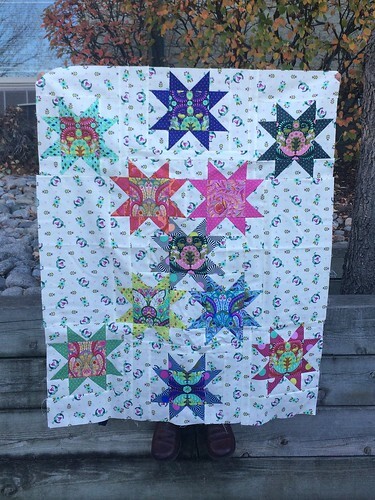 I am a sucker for stars and your pattern is fabulous! Lovely quilt. Good luck with your pattern launch 🙂 And I agree, the two keynotes were great. Lovely pattern! Best of luck in your efforts. It can be slow to get started, but persevere! The quilt is beautiful. Good luck with your pattern designs!! Love your quilt Lisa!!! What a great design and use of Slow and Steady!!! Your daughter is just sooo adorable!!! Love her!